The Vonn Jazz Lounge is offering a great package for those looking for some live music, food, and entertainment on Father’s day this Sunday June 20th. 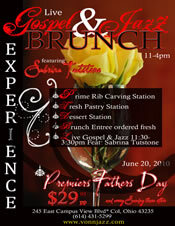 This Sunday marks the first Gospel and Jazz Brunch Experience starting at 11am and running until 4pm. The jazz brunch offers: a prime rib carving station, fresh pastry station, a dessert station, and a brunch entree as well as live gospel and jazz music performed by local singer Sabrina Tutstone. This package will run you $29.95 for the brunch and live music. Kudos to the folks at Vonn Jazz for offering a great package of food and live jazz and gospel for Father’s Day! 245 East Campus View Blvd.